Hello creative friends!! Does Friday seem to sneak up on you sometimes? I am so lost in my days this week. It probably has something to do with getting home on Tues. after attending some new Copic Classes and Creativation this past week. One day melds into the next, and it's hard to keep track. Well, since it is actually Friday, I have a Power Poppy card to share with you today using one of my favorite sets called Simply Camellias. I can hardly believe I've never colored this Camellia in a bowl, so I was excited to give it a try. It's all done with Copics, and the decorative paper is all from Pion. 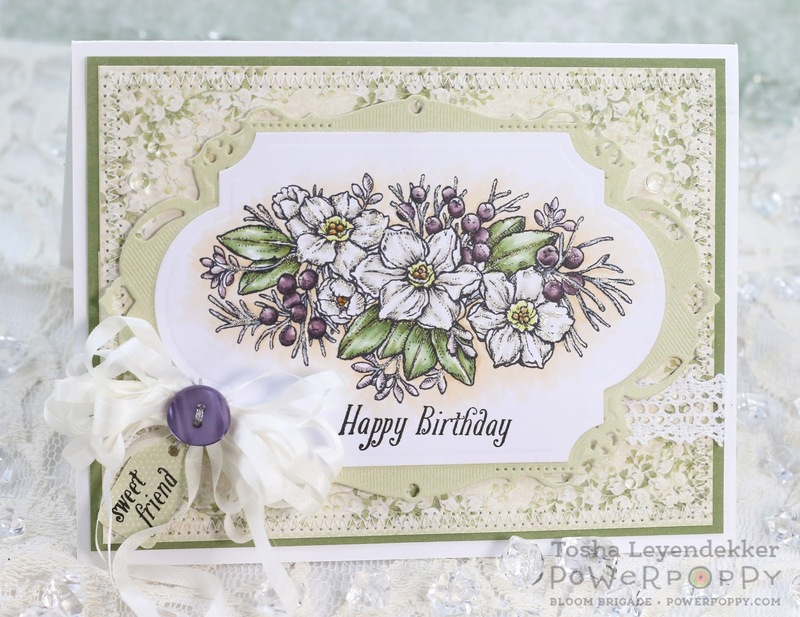 I used a Viva la Verve Sketch from Aug. 2016 so this card came together pretty quickly...for me anyway. 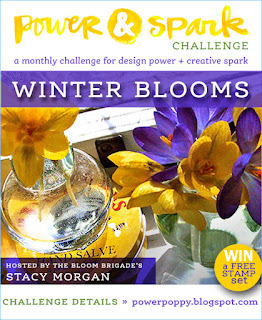 For some more inspiration, stop by the blog of my fellow Bloomie, and dear friend, Stacy. I hope you have a fantastic creative weekend!! Hello, hello, hello!!! Friday has arrived!!! And that means it's time to share some fabulous Power Poppy creations. And today...be still my heart!! 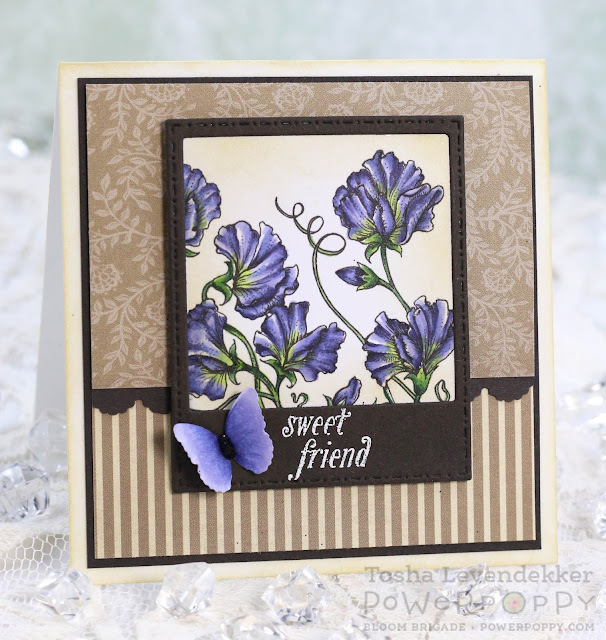 Marcella has designed an absolutely delightful Sweet Pea image that has stolen my heart!! 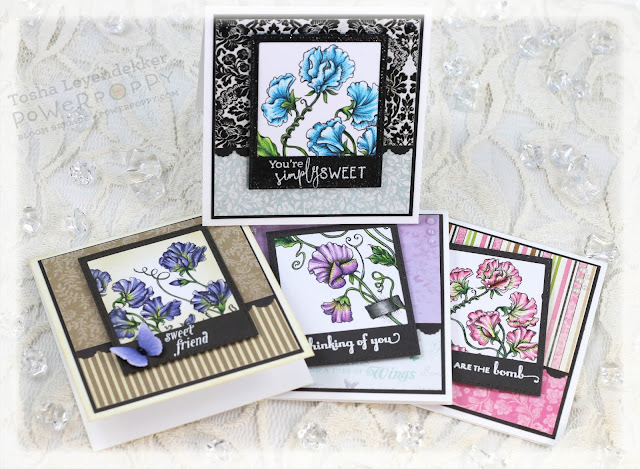 I needed four cards for four very special ladies this weekend, so I decided to print this new digital Power Poppy image, called Sweet Pea Show, four times in two different sizes and diecut different pieces of it. Now, my color combination has no rhyme or reason to it, and I'm sorry for that. I decided to color the images, and then I chose the papers that best coordinated with my coloring. So, they aren't cohesive. The sentiments were all embossed and are from two different Power Poppy Clear sets: Dynamic Duos: Peonies and Tulips and Simply Camellias. I punched a butterfly for this one and colored it with the same Copics as the flowers. The center of the butterfly was made using Ebony Black Gloss Crystal drops with a bit of black glitter sprinkled over it while wet. 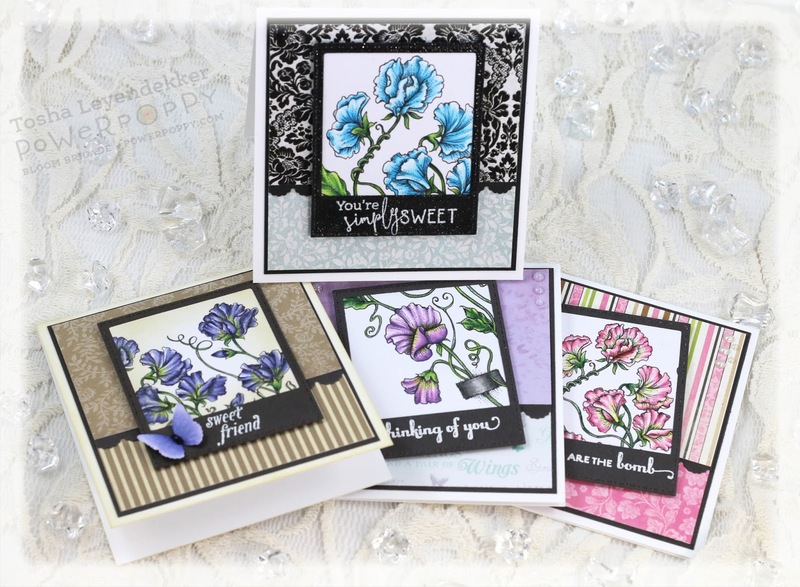 I added different Nuvo Crystal drops in various patterns and colors to each card. For the "You're Simply Sweet" card, I also clear embossed the entire diecut piece to coordinate with the embossed dp I used from Kaisercraft. Whew...that's finally it for today. Thank you so much for dropping by!! Hello creative peeps!! 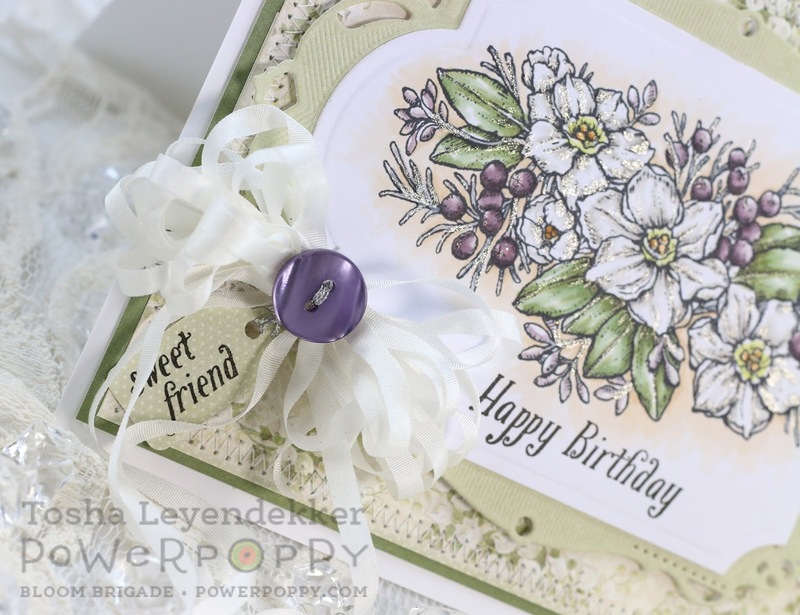 This is my very first card for 2017, and it's for a new Power Poppy Power and Spark Challenge issued by our very dear, sweet and talented Bloomie...Stacy! 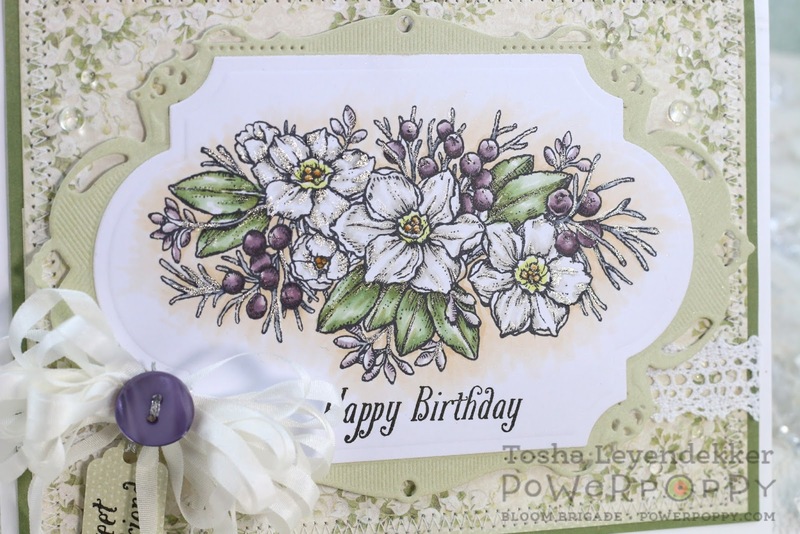 She is challenging us to use Winter Flowers for our projects this month, so I chose the gorgeous Paperwhites from the Power Poppy set Glistening Paperwhites. "When winter comes, many of us long to say goodbye to the chill and say hello to those cheerful and fresh spring flowers! Did you know there are lots of blooms that sprout at the end of winter (you can cheat and include early spring as well)? How about camellias, crocus, paperwhites, holly, snowdrops, or poinsettias? Let's see how you can bring these pretty little petals and glorious greens to life and enjoy this last bit of winter as well!" 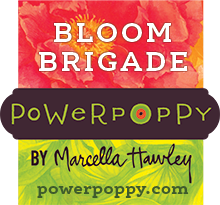 Click HERE to check out all the Power Poppy Winter Blooms. I'm really into plum tones lately. I don't know why, but I'm drawn to them. So I decided to color the berries plum, and went with a "sagey" green background and base. 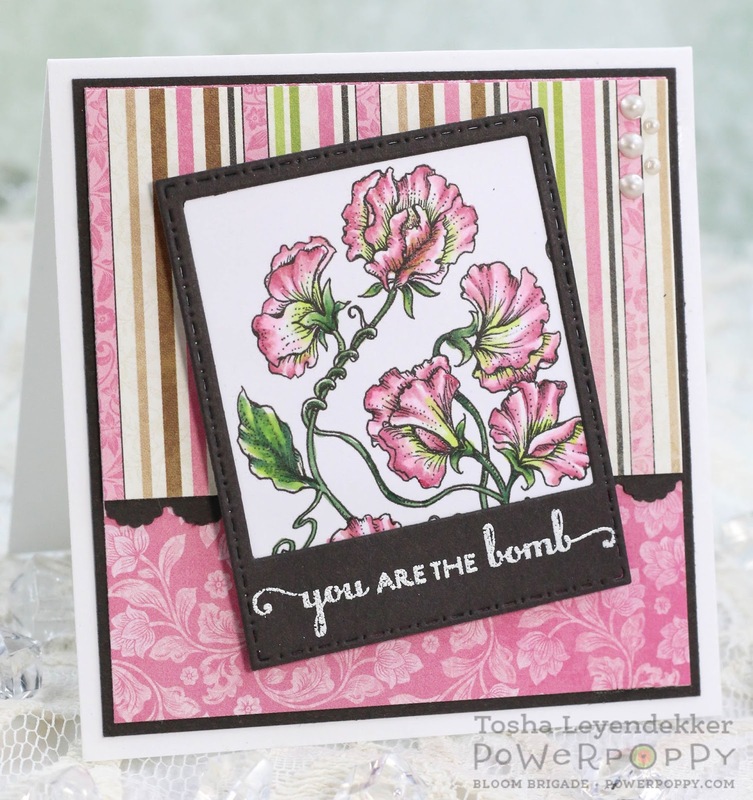 The image is colored with Copics, and the sentiments are from the Power Poppy set Go Wild. I added some clear Wink of Stella to all the blooms for a bit of sparkle. If you click on the images, you can see the details more clearly. I also used one of my old Martha Stewart tag dies to add a sweet little sentiment to my bow. And lastly, I used papers from the Pion design collection called Christmas in Norway. I love their soft vintagey colors! That sums up my project for today. Be sure to stop by the following Bloom Brigaders for some more inspiration. And of course, the Power Poppy Blog is always popping with inspiration. Thank for dropping by! I'm looking forward to an inspiring 2017. I hope you'll join me!